Quantachrome and Anton Paar finished the purchasing process on February 9 at the Quantachrome headquarters in Boynton Beach, Florida. The companies agreed not to disclose the purchase price. Under the umbrella of the Anton Paar Group, the company will continue operations in Boynton Beach. Georg Cortolezis-Supp, Executive Director Production & Purchasing at Anton Paar, will manage the new subsidiary which is the seventh producing company within the Anton Paar Group. In line with the strategy of Anton Paar, the company is currently planning a modernization and expansion of the plant. The former president Scott Lowell and CFO Lauren Spector will provide support in the transitional period. Quantachrome is a renowned, family-owned company with a long tradition in the analytics business. Founded in 1968, the corporation with 170 employees made a name for itself as a global leader in designing characterization instruments for the analysis of porous materials and powders. The instrumentation is used in industrial and research laboratories for the study of surfaces, density, pore size and distribution, and specific gas and vapor interactions. These physical properties are essential qualities of battery and fuel cell materials, catalysts, pharmaceutical powders, ceramics, zeolites, bio- and foam materials, or food products. The technology is related to the BET-method (developed by Stephen Brunauer, Paul Hugh Emmett, and Edward Teller) that uses gas adsorption to determine the surface area of porous components. Quantachrome produces instruments for sample preparation and analysis and has subsidiaries in China and Japan, sells 25 instrument types in 50+ countries, and serves renowned customers all over the world. Established in 1922 in Graz, Austria, Anton Paar is the world leader in the measurement of density and rheology, the determination of dissolved CO2, and in the field of rheometry. Anton Paar’s customers include most of the major beer and soft drink manufacturers worldwide as well as companies active in the food, chemicals, and pharmaceutical industries. Established as a one-man locksmith’s workshop in Graz, Austria, the corporation strives to combine high-precision manufacturing with the latest scientific achievements; the Anton Paar GmbH invests 20 % of the annual turnover in research. 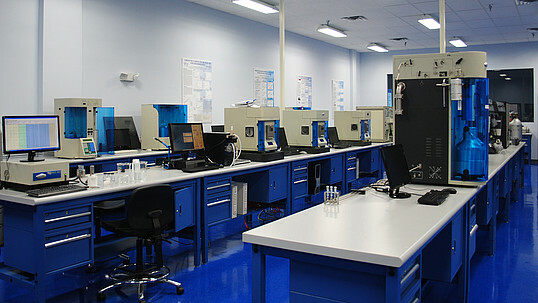 The analytical devices are developed and produced almost exclusively within the company. The Anton Paar Group is active in more than 110 countries with 29 sales subsidiaries and – following the acquisition of Quantachrome – seven producing firms in Europe and the USA. About 2900 employees (including Quantachrome) in a worldwide network of research and development, production, sales, and support are responsible for the quality, reliability, and service of products made by Anton Paar. Since 2003, the Charitable Santner Foundation is the owner of Anton Paar. It is dedicated exclusively and directly to charitable purposes. Besides focusing on research and development, Anton Paar’s growth is also based on strategic acquisitions. In 2007, the company acquired Dr. Kernchen GmbH near Hannover (Germany, now Anton Paar OptoTec) followed by Petrotest Group (Germany, Anton Paar ProveTec) in 2012, and the addition of CSM Instruments SA in Switzerland in 2014 (Anton Paar TriTec). Investing in the modernization of all these businesses, the number of employees, as well as the local turnovers, has been multiplied. In 2016, Anton Paar acquired a product line of Raman benchtop devices from BaySpec Inc. (USA, CA) and licensed the technology for Raman handheld instruments from SciAps Inc. (USA, MA). In 2017, Anton Paar integrated technology for particle size analysis bought from Cilas (France) into the product portfolio.